Teens love the idea of zombies. They also love to dress the part. So, attending a science café dressed in ragged clothes coated in blood was not to be missed. 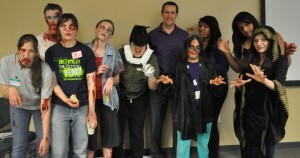 Zombies invade Los Alamos Teen Cafe to learn more about what destroyed their brains! 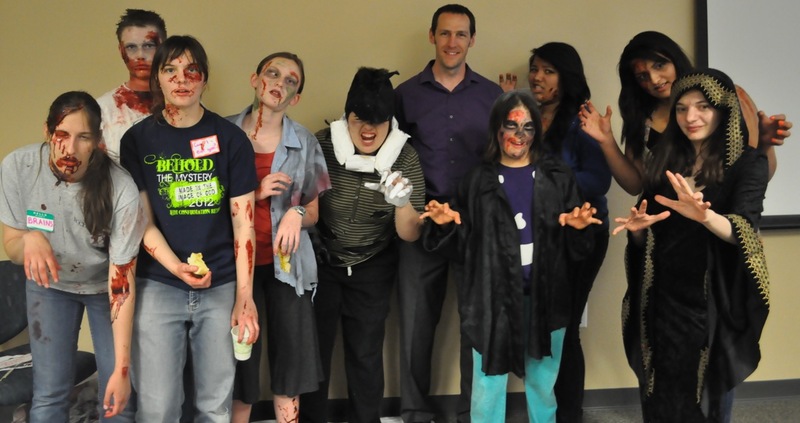 In this café presentation by Dr. Russell Morton, University of New Mexico College of Medicine, teens learned how the brain controls emotions and behaviors, with help from the pop culture star of science fiction: zombies. They learned which parts of the brain perform specific functions and how damage to that part of the brain might induce zombie-like behavior. This was an engaging and fun way to teach about brain neuroscience. Learning which parts of the brain do what can be confusing with all the new terms for each part of the brain and the sometimes multiple functions of each part. But putting it in a context of comparing and contrasting human versus zombie behavior caused by differences in the brain development was really powerful. It did not hurt that the presenter delivered the story with a tongue in cheek style that occasionally left the audience wondering if he actually believes in zombies. To top it all off, the presentation incorporated video clips from every popular zombie movie of the last 40 years, beginning with Night of the Living Dead and Dawn of the Dead and closing with Michael Jackson in the movie Thriller singing and dancing with a cast of zombies. Our presenter collaborated with Dr. Bradley Voytek, a neuroscientist and author of a study on the zombie brain in development of this presentation who was featured in Zombies on the Brain. Dr. Voytek achieved a level of fame when he participated in a panel of experts at last year’s Comic-Con International, an annual science-fiction convention in San Diego. Another member of the panel was Max M. Brooks, who wrote The Zombie Survival Guide and World War Z. As a result, this was a well-polished presentation with solid science and gripping science fiction. The presenter brought along some actual human brains and allowed the teens to handle them with latex gloves. The teens found this to be fascinating, waiting four-deep at the table for their turn with the brains. He also brought along a vision distortion game that challenges players to throw balls at a target, then take the glasses off and try to hit the target. It demonstrates how some players’ brains learn to compensate more quickly than others for the visual distortion and how for some players, once the vision distorting glasses are off, their brain is still trying to correct for the prior distortion. This game was wildly popular; hilarity ensued. A zombie survival trivia challenge was offered while the audience was gathering. We also gave a door prize for the best zombie costume. Those who chose to dress up provided great entertainment for the rest of the audience. Some Native American pueblos forbid wearing make up, so we did not have the costume contest at the Café serving that population.